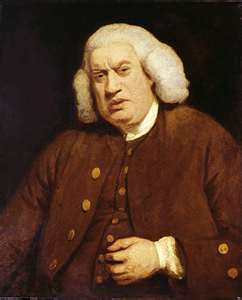 HE WAS KNOWN as Dictionary Johnson, creator of the first English dictionary, under some very difficult circumstances. Before then, he eked out a living as a journalist, sometimes making up the speeches that were supposedly given in Parliament. Evening. May 16, 1763. James Boswell, an impressionable 22-year-old from Scotland, is about to meet Dr. Samuel Johnson for the first time. Boswell had tried to meet Johnson a number of times but something always went wrong at the last minute. Then, quite unexpectedly, while he was having tea with Mr. Davies, the bookseller and sometime actor, Johnson suddenly made an appearance. By this time, Boswell, who liked to hobnob with the talented and famous, was highly agitated and nervous, wanting to insinuate himself to Johnson, yet frightened of saying the wrong thing. This passage still resonates, even after 254 years, as does this memorable account of Johnson’s meeting with David Garrick, a famous actor of the day and a former pupil from Johnson’s teaching days. They are standing backstage in Garrick’s theatre and Garrick had just asked Johnson how he liked it. WHERE? Bangkok. WHEN? March 9-12. Now in its 15th year, the King’s Cup Elephant Polo Tournament has become one of the biggest charitable events in Southeast Asia with over US$1.3 million (BHT 46 million) raised and donated to projects that better the lives of Thailand’s wild and domesticated elephant population. Thirty unemployed former street elephants will take part in this year’s festival, during which they will be given full veterinary checks and care, much needed food and drink and essential vitamin supplements for the duration of the event. The welfare of the elephants that participate in the King’s Cup Elephant Polo Tournament is of paramount importance, with strict rules ensuring that the pachyderms are well cared for at all times. By imposing a “no micro-chip, no game” rule, Anantara, which sponsors the annual event, guarantees that all participating elephants have been domestically bred and not captured from the wild or smuggled in from neighbouring countries. The King’s Cup Elephant Polo Tournament recently awarded a silver medal for Sports CSR Initiative of the Year at the Asia 2016 SPIA Sports Industry Awards. Organized by Sport360° and MMC Sportz, in partnership with the Thai Ministry of Tourism and Sports and the Sports Authority of Thailand, the awards applauds sports industry leaders that demonstrate a balance between business, community and environment. The 2017 event will have 10 teams encompassing over 40 players, including Thai celebrities, supermodels, professional horse polo players and New Zealand All-Blacks rugby players. The four-day festival will have something for everyone including an impressive Opening Parade, Children’s Educational Day, Ladies Day, known as The ‘Bangkok Ascot’, and fun elephant related activities. Anantara has long been associated with elephant conservation efforts with the formation of The Golden Triangle Asian Elephant Foundation, which has performed over 40 rescues of elephants off the streets of Thailand, as well as bringing the hugely successful Elephant Parade to Bangkok. CHRISTMAS IS A SPECIAL OCCASION at Bayan Tree Samui, with three different meals to choose from on Christmas Eve and two different options on Christmas Day, plus an new year to remember. On Christmas Eve, you can choose a gala dinner at the Edge – a buffet starting at 6 p.m., and featuring antipasti as well as traditional favourites; or a Royal Thai set five-course dinner at the Saffron, also starting at 6 p.m.; and a five course set dinner at the Sands, starting at 8 p.m. If you’re in the mood for turkey on Christmas Day, head for the Sands, which is offering a special BBQ dinner that not only features turkey but a wide selection of sea and land favourites prepared at a live cooking station. Dinner starts at 7 p.m. Saffron will be offering a Thai culinary journey featuring a set dinner. Dinner starts at 6 p.m.
New Year’s Eve is Tropical Disco Night that starts with three different dining options – a Tropical Disco Gala buffet with live entertainment at the Edge from 7 to 10 p.m., while Saffron will be offering at a set dinner of Thai favourites. The scene shifts to the beach for a countdown party from 10 p.m. to 3 a.m. for a full evening od dancing and partying. And then, at the stroke of midnight, you can raise a glass of Champagne to welcome in the New Year. FROM THE 16TH TO 18TH OF DECEMBER, shores of Phuket welcome Superyachts, their owners, captains and VIP guests to the Asia Superyacht Rendez-vous. This exclusive invite-only event welcomes sail and power superyachts over 70 feet from all over the world for three days of excitement. This year SALA Phuket Resort and Spa will be host to the Rendezvous. For the first time there will be a cup for the winner but yachts are also encouraged to participate in pleasure sailing (if racing does not appeal to them), they will be welcome to get the sails up while leisurely cruising around the course and motor yachts are encouraged to anchor around the course. SALA Phuket Resort invites guests to experience this unique event in style at the resort, with rates starting from THB 5,838 THB. SPECIAL MENUS have been created by Executive Chef Chriz Patzold for two of Four Seasons Koh Samui’s distinctive restaurants to celebrate Christmas in style. Pla Pla is offering traditional roast turkey, a glass of chilled Cava and plum pudding, while KOH Tai Kitchen & Bar will be serving a Thai-inspired Christmas menu that includes a complimentary wine. New Year’s Eve festivities start with a special dinner to mark the occasion at one of the resort’s restaurants that features lobsters, oysters, foi gras, a pasta station and special Thai selections; or a Gala Dinner at Pla Pla restaurant, or festive dining at the Beach House. Following dinner make your way to the Latin American Countdown party around the infinity edge pool beside the ocean, listening to the resort’s Latin Band and DJ music featuring hits from today and yesterday, dancing, and a fireworks display while feasting on desserts and free-flowing chilled Champagne all the way to the 2017 countdown. For more information and reservations, call the Festive Desk Team at telephone: +66 77 243 000 or e-mail Concierge.Kohsamui@fourseasons.com. INTELLIGENT SPAS has just released a new spa operations and treatments package that includes a spa operations procedures and policies manual and a professional spa treatments manual. Julie Garrow, Intelligent Spas’ president, describes the spa operations practices manual as a “virtual consultant, detailing practical guidelines you man reference and customize to your own specific requirements”. Fast-track training for new spas and new employees, or ensure service standards are continuously maintained in established spas, by implementing great quality and highly consistent treatment delivery protocols. The professional spa treatments manual is specifically designed with “highly consistent” procedures and scripts to make it easy for therapists to remember and deliver quality spa treatments, resulting is satisfying spa experiences which generates increased client loyalty and produces better consumer ratings and reviews. The 31 detailed spa treatment procedures included in the manual cover: Water, Massage, Body, Face, Nails, Hair, and Extras, including waxing. Supporting verbal scripts, product lists and process maps are also included to help guide training and implementation. The editable file is provided so you may customize the contents to your own specific requirements. A secure PDF file and an editable Microsoft Word file are provided for easy customization. She sees four key spa results from the treatment procedures manual – lower training costs; faster time to market for spas in the pre-opening phase; easier treatment delivery for multi-skilled therapists, and increased client loyalty. Intelligent Spas is also offering Spa Sessions Team Meeting Guides, which focus on three key areas: Business Success, Team Performance and Service Experience. The guide features 60 meeting topics to give the spa a continuous stream of performance improving ideas, such as: Upselling, Cost controls, Adding value, Communication, Safety, Professionalism, Ethics, Delivering and Caring. The Spa Sessions are designed to be relevant for all spa types and locations – from large spas to small salons, globally. They allow spa teams to come up with customized solutions for their specific business model – the key to best learning outcomes. A section entitled Session Starters is also included to help guide the meetings and prompt discussion. Intelligent Spas has also prepared a Wellness Spas Benchmark Report, which is the first study to specifically identify key performance indicators for wellness spas. The report contains a variety of statistics to help wellness spas better compete in the global spa industry. Information was collected via a detailed survey completed by spa owners/managers, then combined with additional research conducted by Intelligent Spas to provide a concise financial report. Conrtact Intelligent Spas for further information and pricing. WITH THE ULTIMATE INDULGENCE for mind and body at the forefront, Six Senses is introducing delicious and nutritious smoothies and juices that incorporate important nutrients to keep the trillions of cells that make up the microbiome (pathogenic micro-organisms that enjoy a mutualistic relationship with the human body) in balance. Cutting edge research from Dr. Steven Gundry’s institutes, The Center for Restorative Medicine and The International Heart and Lung Institute, both in California, has shown that feeding the body’s microbiome nutrient dense fibers and resistant starches dramatically improves over-all health. Moreover, healthy gut bacteria (Dr. Gundry calls them gut buddies) has been shown to improve mood and attitude. Dr. Gundry serves on the Six Senses Wellness Board and has been collaborating with Six Senses in reviewing all menus and enhancing them so guests can enjoy the same great taste, but prepared in an even healthier fashion. The project is called Eat with Six Senses. Chefs are creating low-sugar and low-sodium items, gluten-, soy- and hormone-free options, identifying 90 to 100% of menu items as organic and keeping a close eye on lectins. The first project Dr. Gundry worked on, in tandem with Nutrition Consultant Patrick Wahlberg and Sophie Bohnstedt of Sophie’s Raw in Stockholm, is the smoothie and juice menu. Six Senses is committed to serving refreshing, tasty juices and smoothies that feed gut buddies life-giving nutrients. And as a result, the new menu includes drinks that include a variety of vegetables, herbs, spices and fruit that contain lower amounts of fructose. In addition, the drinks provide a nutritionally rich boost of concentrated micronutrients … it’s like a supplement in a glass. Guests who select to join one of the Six Senses Integrated Wellness programs: Cleanse & Detox; Sleep & Resilience; Trim & Fit and 100% Full Potential, are guided to which juices and smoothies are best suited to their wellness regime. For those not on a program, they will find the selections equally tempting and nutritious. For those on the Cleanse & Detox program, the Green Senses juice is packed with ingredients to promote and support detoxification such as kale and broccoli. They also include fennel and parsley which are filled with antioxidants; cilantro which binds heavy metals; ginger which offers anti-inflammatory properties and pineapple which is rich in vitamin C as well as the enzyme bromelain. Smoothie guests should try the Coco Nap to assist with sleep. It’s velvety and refreshing and contains young coconut, papaya, lemon balm and lime. The Trim & Fit smoothies, such as The Hulk, aid post workout recovery and muscle growth. The creaminess of macadamia nuts together with spinach and the richness of exotic spices make this a delicious green smoothie with a hint of Brazil nuts. This smoothie also works very well with protein powder. Eat with Six Senses, a group-wide menu revamp that features low-sugar and low-sodium items, gluten-, soy- and hormone-free dining options, launches in 2017 at all resorts and spas. In addition to serving seasonal and sustainable food items, 90 to 100 percent of menu items will be organic. Efforts also include the reduction of lectins found in grains, beans and nightshades which cause chronic inflammation, digestive problems and degenerative conditions in some people. USHER IN THE NEW YEAR or KHOM LAI at Four Seasons Chiang Mai by making a wish and releasing a candle-lit rice paper balloon into the night sky on the stroke of midnight. The evening starts with family-style pre-dinner cocktails at 7 p.m., followed by an international gala with a countdown to 2017 at an exclusive pool party, featuring DJ Hed Kanadi from London’s No. 1 Dance and House Club, Ministry of Sound. Christmas festivities include a Christmas Eve festive dinner buffet on Dec. 24 that includes Christmas favourites, international delicacies and cuisine to order at live cooking stations with a live jazz band playing Christmas songs. Christmas Day starts with a brunch at the resort’s new cooking school, Rim Tai Kitchen, featuring honey-glazed ham, seafood on ice, guinea fowl and other dishes from around the world, and a jazz band playing Christmas favourites.